The Redemptorists » "He’s one of them"
As the world welcomed Pope Francis, Redemptorists in the Baltimore Province joined in the celebration. 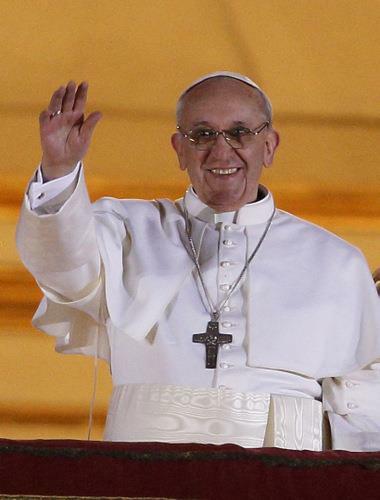 "May God be praised and honored by the election of Pope Francis!" said Baltimore Provincial Kevin Moley. "He must have been seen by the Cardinals, through the inspiration of the Holy Spirit, as the right man and the man of God for so important and so necessary a service to the people of God. "The first thing that the new Pope Francis asked for was that the people pray for him," Father Moley continued. "Pope Francis knows and wants the prayers and blessings of the whole Church, if he is to do God’s work on this earth. He knows that and asked humbly for people’s prayers and blessings. "He lives simply. He is humble. He is pastoral. And he is not afraid to call the Church a hypocrite when the Church is more interested in its administrative image than as a loving image to the poor, the needy, the sinner and the people of God." True to our charism of carrying the Gospel to the poorest and most abandoned, many of our missionaries serve in very poor inner-city parishes with large Hispanic communities. "The people are just so happy. For all these immigrants who are here and the poor people throughout the world really, it brings them so much pride and dignity to have somebody who they can say represents them," said Father Robert Wojtek, pastor of Sacred Heart of Jesus/Sagrado Corazón de Jesús Parish in Baltimore. The parish serves as a major center of Hispanic ministry in the Archdiocese of Baltimore. "There’s so little chance for people to make something of themselves, and they just feel like second-class citizens, if that. And yet now, it’s this realization that, ‘wow, he’s one of us.’ And on top of that, his whole witness of life, the solidarity with the poor — that authenticity is what really speaks to people." The mood was jubilant at the evening Mass at St. Patrick’s in the Fells Point neighborhood of Baltimore. The parish is a mission of Sagrado Corazon. Click below to watch the video coverage (St. Patrick’s appears from the beginning to 1:20). In Philadelphia, Father John Olenick is pastor of Visitation of the Blessed Virgin Mary Parish, which serves large Hispanic and Vietnamese communities. At the evening Spanish Mass "people were ecstatic." "They were coming up to me after Mass saying, ‘We have a Latino pope!’ So there’s definitely a lot of excitement," Father Olenick said. "Especially in Philadelphia because the pope is scheduled to come here in 2015 for the World Meeting of Families. So he’s coming to them, and I know he’ll definitely say something in Spanish and he’ll probably say quite a bit in Spanish! "It gives them a feeling of legitimacy, that they feel he’s one of them and he’s going to understand where they’re coming from. I think the unity of the culture and the language is something that really speaks to them," Father Olenick said. The new pope greeted the world just as school was letting out at the Redemptorists’ St. Mary’s Parish in Annapolis, MD. Click below for interviews with some of the high school students, and a Spanish interview with Redemptorist Father Blas Cáceres.